Transforming complex business models into data-driven online experiences. 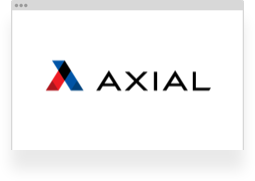 Over 10 years designing SaaS applications for b2b and enterprise companies. Evaluate the business goals of the company and the needs of their users. Investigate the challenges users have accomplishing their tasks and any roadblocks that may be encountered. Formulate a heuristic task list, create initial workflows that leverage technology and design to make it easy for the user to complete objectives. Create prototypes and iterate as fast as possible, by making the optimal design choices for the product shipment window. Test, access results, iterate again. Able to collaborate with multiple business units across a company. Experienced with wearing multiple hats (design, dev, product) from five years of working with early stage startups. Able to balance and prioritize business and user requirements. Expertise in incorporating these requirements into a well-thought product development process. Healthcare providers are under increased pressure to improve the patient experience today. For two years, I was responsible for the design and front-end development of the RateMyHospital™ product from Quality Reviews. The company was a four person team — I worked along with one engineer and two physicians. The Business Issue at Stake: After patients are discharged, they receive a paper survey in the mail. This approach is slow — It can require up to three months for patients to receive a survey. This delay contributes to a very low response rate. Sorting the handwritten responses is a time consuming process. Obtaining precise data is nearly impossible. With the pervasiveness of smartphones in the patient population, we were able to replace the process of paper surveys. We developed technology to send text messages through the hospitals' patient registry immediately after discharge. The patient clicks on a text link from their healthcare provider that launches the feedback tool in the smartphone's web browser . Rather than replicating a multiple choice questionnaire (view example), my UX approach was to make it intuitive and easy to complete. 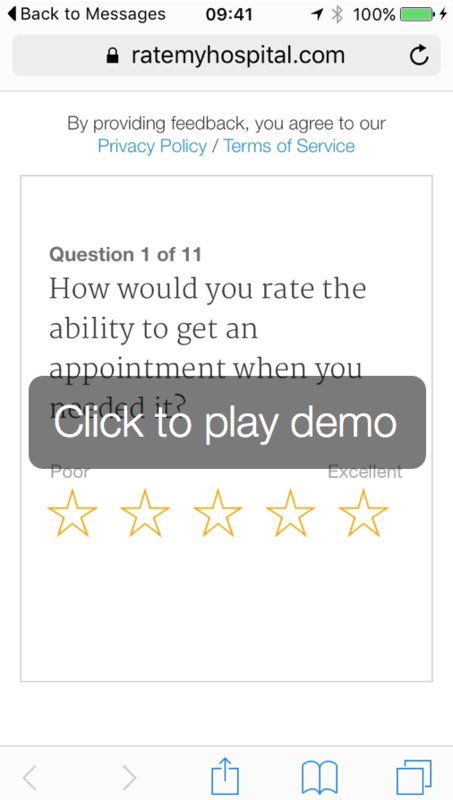 The five star, scrollable interface allows the user to fill the survey as fast as they want or skip questions they cannot answer. Survey results are delivered to the hospital administrator as soon as the patient clicks submit. 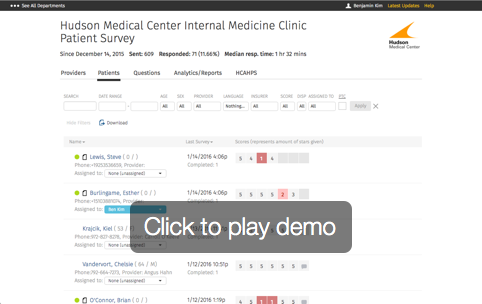 Unlike paper surveys, RateMyHospital’s feedback can be used to improve the healthcare provider’s service within the same day of the patient's reply. With the increase in the amount of surveys completed, and the decrease in completion time, not only do healthcare administrators have a barometer on how well their facility is doing, but are able to start seeing patterns and trends on the feedback dashboard and visualization tools provided.